Purchased from the artist by (Dr. Herbert Tannenbaum [1892-1958], Das Kunsthaus, Mannheim); sold to Theodore Franck [d. 1953], Berlin and Los Angeles; by inheritance to his daughter, Mrs. Felix Gelber, Los Angeles; (Perls Galleries, New York); purchased 1 August 1973 by NGA. The provenance of the painting is given in a letter of 8 January 1973 from Klaus G. Perls, director of Perls Galleries, to Charles Parkhurst (in NGA curatorial files). Theodor Franck was director of the Deutsche Bank in Berlin; his daughter brought the painting to the United States. 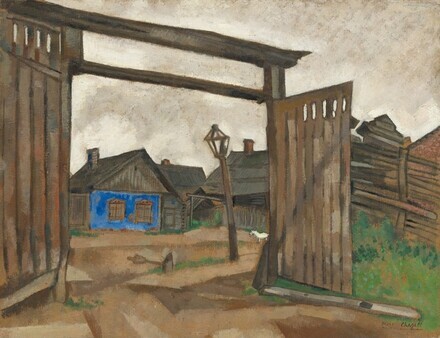 Tannenbaum's Mannheim gallery exhibited Chagall in 1924 and again in 1927; it is likely the Houses at Vitebsk was sold on one of these occassions. On Tannenbaum see Für die Kunst! Herbert Tannenbaum und sein Kunsthaus. Ein Galerist - seine Künstler, seine Kunden, sein Konzept, exh. cat., Mannheim, Reiß-Museum der Stadt Mannheim, 1994. Verehrt und Verfemt -- Chagall und Deutschland, Jüdisches Museum, Frankfurt; Stiftung "Brandenburger Tor" der Bankgesellschaft Berlin, Max Liebermann Haus, 2004, no. 23, pl. 21. Mark Chagall and Jewish Mysticism, Utsunomiya Museum of Art; Mie Prefectural Art Museum, Tsu; Chiba City Museum of Art, 2007, no. 15, repro. Chagall, Nassau County Museum of Art, Roslyn Harbor, 2012, unnumbered catalogue, fig. 11. Chagall, Modern Master, Kunsthaus Zürich; Tate Liverpool, 2013, no. 46, repro..
Marc Chagall: Una retrospettiva 1908-1985, Palazzo Reale, Milan; Musées royaux des Beaux-Arts de Belgique, Brussels, 2014-2015, unnumbered catalogue, repro. European Paintings: An Illustrated Summary Catalogue. National Gallery of Art, Washington, 1975: 64, repro. European Paintings: An Illustrated Catalogue. National Gallery of Art, Washington, 1985: 84, repro.